A new range of premium crane machines from Taiwan are now available for purchase at Highway Entertainment. 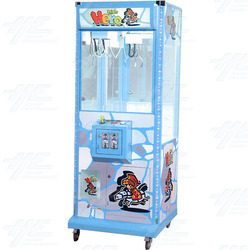 These crane machines are manufactured by Tommy Bear and are superior to many other crane machines currently available in the market. Each model of crane machine has five modes of play to diversify operations. These modes include Vending, Gaming, Accumulating, Time Limited and Random. The machines all feature removable operations doors that allows for convenient access and maintenance. Also maximising convenience is the ability to digitally adjust the power of the claw through the push button and joystick. The stand out feature of the premium crane machines is the drop tray sensor that calculates the machine's payout percentage. The sensor keeps track of how much money is inserted into the machine and how many prizes are dispensed on a weekly basis. The machines can be configured with a number of different size claws, making them extremely versatile and suited to nearly all times of prizes. These machines can also be fully customised with your company's colours, logos and artworks.